parties Melbourne, kids birthday parties. KIDS REPTILE PARTIES, KIDS PARTIES WITH REPTILES IN MELBOURNE. KIDS REPTILE PARTIES WITH SNAKEBUSTERS ARE THE BEST. THE BEST KID'S REPTILE PARTY IN MELBOURNE IS SNAKEBUSTERS! Kid's reptile parties? Well, if you are based in Melbourne, Victoria, Australia, then forget The Wiggles, Hi five, McDonald's, Kid's Zones and the rest. Nothing in Melbourne competes with Snakebusters and live reptiles to give the kid's fun at their kid's reptile party. Live reptiles will appeal to all age groups and gender ... no one will feel left out at a snake busters reptile party. What's more, it's educational and interactive, so they actually learn things of use at the same time at their kid's reptile party. At our reptile parties, the kid's will learn the basics of snake safety, conservation of wildlife, how they live and even get the chance to touch, handle or even hug reptiles if they want to. Yes, Snakebusters are the "hold the animals" people. No one does more "hands on" than snakebusters at a snakebusters reptile party. The reptiles used at the snakebusters kid's reptile parties are tame and we are alone in our industry in bringing deadly snakes to our kid's reptile parties that are guaranteed "Risk free" making the snakebusters kid's reptile parties unbeatable. Often it's the adults that seem to get more from the kid's reptile parties than the kid's at the party. Our animals include crocodiles, frogs, tortoises and yes, the world's top five deadliest snakes, brought to your home, school or business in total safety. A kid's reptile birthday party without the deadly snakes is really only half a birthday party. Don't get burn't with a second rate reptile party that only has the same reptiles that you'd find in any local pet store. Yes adults and kid's get into a Snakebusters kid's party, so perhaps we should call them the snakebusters adults and kid's parties. Adults and kid learn things that they never knew from Australia's leading reptile experts, including Australia's snake man Raymond Hoser and also often get their first ever close encounters with reptiles in an educational reptile party setting with reptiles. Yes, with Snakebusters you don't just get a presenter at your kid's party with reptiles, you also get Australia's most experienced snakeman who knows his stuff better than anyone else. For your kid's party, go for the best! Raymond Hoser has two young kid of his own (aged 3 and 5 in 2004, or 7 and 9 in 2008) and so he knows their "on" and "off" buttons like only a parent at a party can ... (as it happens, none of our competitors even have kid's!). What makes a snakebusters kid's reptile party better than other advertised "kid's reptile parties"? Several things actually, (see the link for all shows and parties), but the main thing that people notice is that our shows, parties and educational school incursions are "full-on - hands-on" as in usually everyone holds pretty much everything - AND - without waiting. Lots more critters at a time at a snakebusters kid's reptile party and kid's can hang onto their reptiles rather than handing them on at our reptile party, because we bring enough for everyone to handle the animals at the same time! No other kid's reptile party, crocodile parties, educational school incursion with reptiles or similar comes close to a snakebusters kid's reptile party, educational reptile incursion or similar. Yes our kid's reptile parties are the party to end all parties! Deadly snakes that don't bite in a kid's reptile party setting (another Snakebusters exclusive), harmless snakes in huge numbers at your kid's party (so everyone can handle the animals), monster pythons, lizards, crocodiles, tortoises, frogs, a gift that isn't junk, etc ... we bring the lot! Pricing is usually $300 per kid's reptile party (2014 rates)(Melbourne metro), which is cheaper than most inferior alternatives. And with Snakebusters in Melbourne, Victoria, Australia, you get the extra's without paying extra! Snakebusters are alone in Melbourne, in not quoting surcharges for Crocodile parties, no extra for lizard parties, turtle parties or the like, no more dollars to bring the deadly snakes, not quoting extra for extra kid above some miniscule number (no limit on kid's at our parties!) and free invitations to our reptile parties (see links here). It is best to phone us (day or evenings are OK), rather than send an e-mail. We don't get all e-mails sent and don't necessarily respond to them straight away. 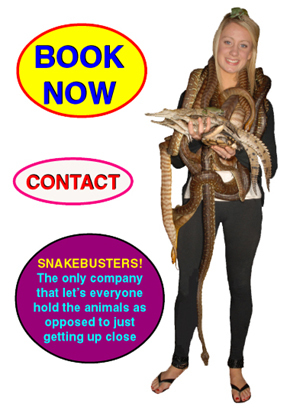 More importantly, as Australia's most sought after wildlife demonstrators for kid's reptile parties, schools and the like, we are always heavily booked, so it is best to book Snakebusters and their live reptiles before sending out invitations and the like for Australia's best live reptile show. mobile - (within Melbourne, Victoria, Australia) 0412 777 211. Frequently asked questions (or questions worth asking if shopping around for a reptile show for your function, reptile party for kid's, school or event). Awesome Snakebusters kids parties invitations. General notes - all shows, including, schools, events, kid's reptile parties, displays, etc. Snakebusters reptile shows, kid's reptile parties, etc - Frequently asked questions. Incursions and shows booking and contact page.